That last bullet is key. I can personally attest after many long nights at Predix hackathons, surrounded by other engineers and resources, that having a ready-to-go library inside the web-based scriptr.io IDE is a godsend (the source for that library, with docs, is here). Here is our blog outlining that wrapper, “IoT Apps for Smart Cities with GE Predix and scriptr.io“. We’ve also implemented a sample application utilizing this wrapper which maps live Current data using scriptr.io’s front-end hosting engine. Back in May we were at IoT World in Santa Clara in force! While boothing at the show, we also participated in the IoT for Cities Hackathon, taking home a runner-up prize for GoGoKart, a system for city managers to maximize food truck revenue. The concept was to monitor real-time foot traffic and parking availability in parks, then route food trucks/vendors toward under-served areas. It also incorporates demographic and historical performance for future recommendations and back-office reporting. The system showcased a tight integration with the Predix websocket datastream (dare I say, the TIGHTEST integration at the event, ahem ahem), a scriptr.io stream analytics layer providing realtime pedestrian count, a Scriptr.io mashup with Twilio/Firebase/Pitney Bowes, AND a full-on EmberJS frontend. You can read more in our post outlining the whole thing! In June, we next attended Hack Red Hook in Brooklyn, NYC. 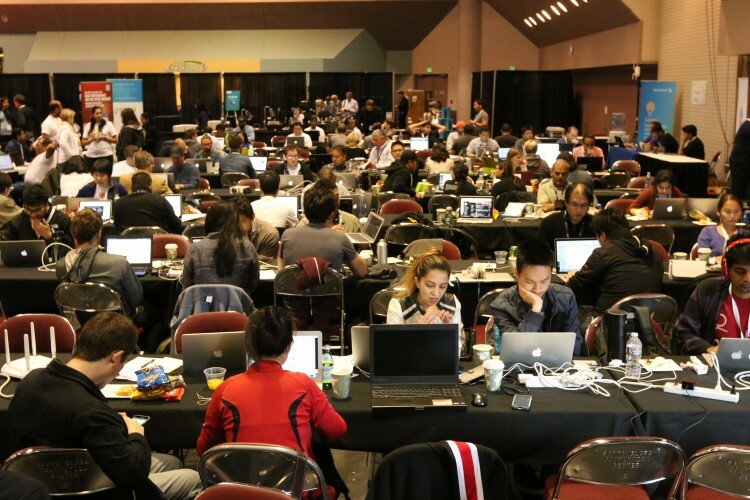 This was a civic hack where I was able to identify a real solid use case through conversations with local stakeholders, something that is nearly always lacking in hackathons. 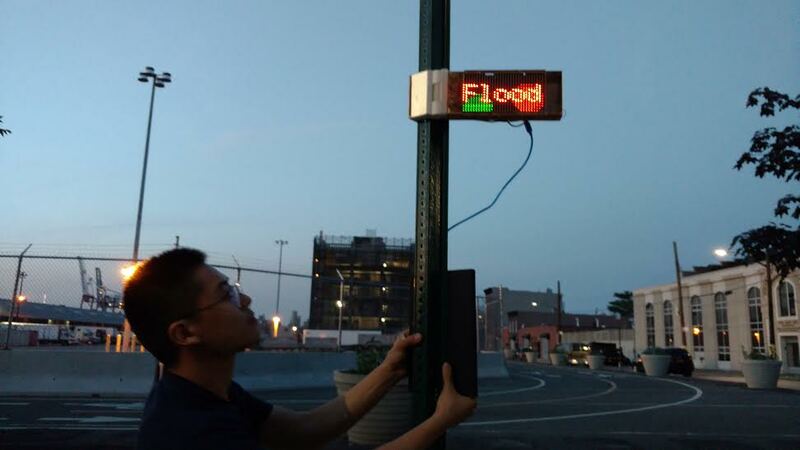 Our end product was called HighGround.nyc, a system that aims to provide for emergency parking out of harm’s way for flood risk vehicles. The use case is extensively detailed in our writeup and video interview. What was particularly cool about HighGround.nyc was that it envisioned deployment of Current Lamps for sensing that strategically leverages their image-processing capabilities. For a few months now we’ve been working on an internal effort called Demandables, informed by exposure to many hackathons and customer use cases. 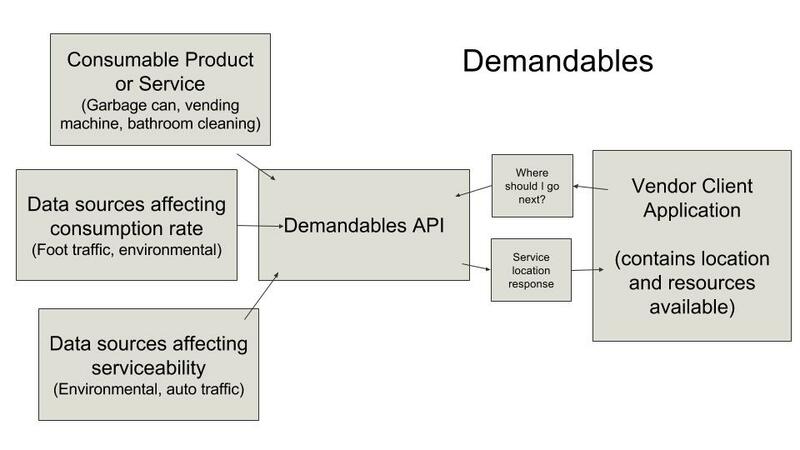 It’s a “Demand API” to solve the common IoT problem set: given a consumable resource and 1) consumer of that resource or 2) vendor/service provider for that resource, answer the question “Where do I go next?”. If you think about the generalized requirements of a range of applications (ie. smart garbage cans / garbage trucks, bathrooms / bathroom cleaner, vending machines / vendor, parking spaces / vehicles), you find that the pattern holds true. The current codebase and stellar documentation can be found here, with the current demo and implementation reflecting what we’d anticipate to soon be driven by Current/Predix realtime data. GE held their first conference for Predix and the Industrial IoT in Las Vegas in July. We were there hacking with GE employees and exploring the burgeoning ISV Partner Program soon being officially launched in November. Below is a video of the live demo of the Current hardware that was being shown on the conference floor. Working with Predix / Current? Let us know! We’d love to hear from other partners in the Predix ecosystem or cities interested in deploying this technology. 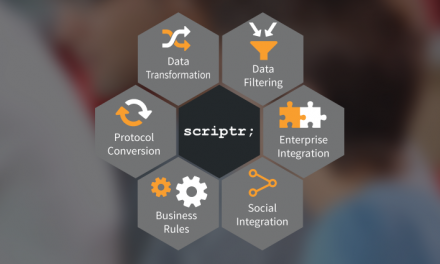 Contact us at info@scriptr.io!